The growing prevalence of individuals diagnosed with neurodegenerative disorders has brought into sharp relief the lack of treatment options for individuals struggling with these diseases. As more is discovered about the mechanisms of these neurodegenerative conditions, increasing evidence indicates a common theme in these proteinopathies is altered cellular protein homeostasis. In particular, the interactions of disease-associated proteins with the major cellular chaperones, heat shock proteins90 kDa and 70 kDa (Hsp90/Hsp70), are changed. Therefore, a promising strategy for therapeutic intervention is chemical inhibition and modification of these molecular chaperone proteins. 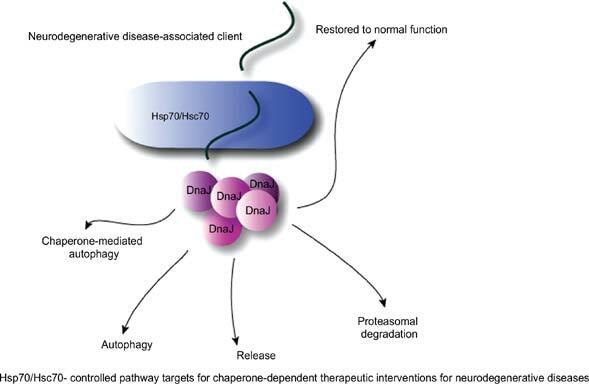 Here we review the rationale behind therapeutic strategies targeting Hsp70 and its complement of co-chaperones, and describe the current literature regarding the use of small molecule inhibitors of Hsp70 in models of neurodegenerative disease. Alzheimer’s disease, Chaperone, Heat shock protein, Parkinson’s disease, Tau, Small molecule inhibitors. Department of Molecular, 4001 E Fletcher Ave MDC 36, Tampa, FL, 33613, USA.